This action allows you to prompt the user to enter a password at run time. Specify the title shown in the password prompt. Specify the text given to the user in the prompt. This value will be used to automatically generate the verification text. 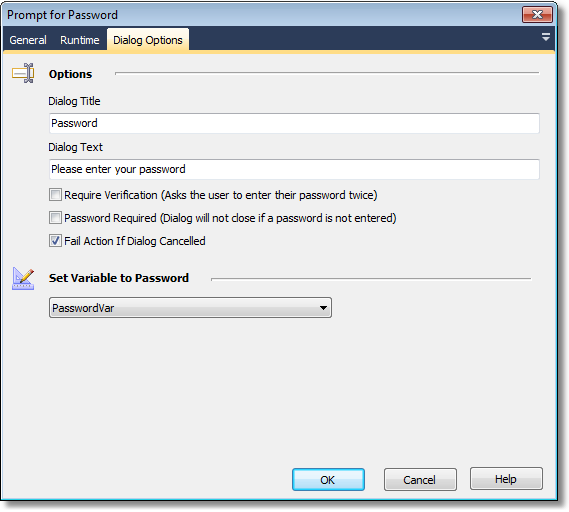 Normally the dialog will prompt the user to enter a password in once, this can be changed so that the password must be entered twice by setting this option. Enabling this option forces the user to either enter a password or cancel the dialog. By default this action will fail if the user cancels or closes the dialog. Changing this option will allow the build to continue even if the dialog was cancelled. Select the variable for the password to be saved back into. This variable may then be subsequently used in other actions that require the password.